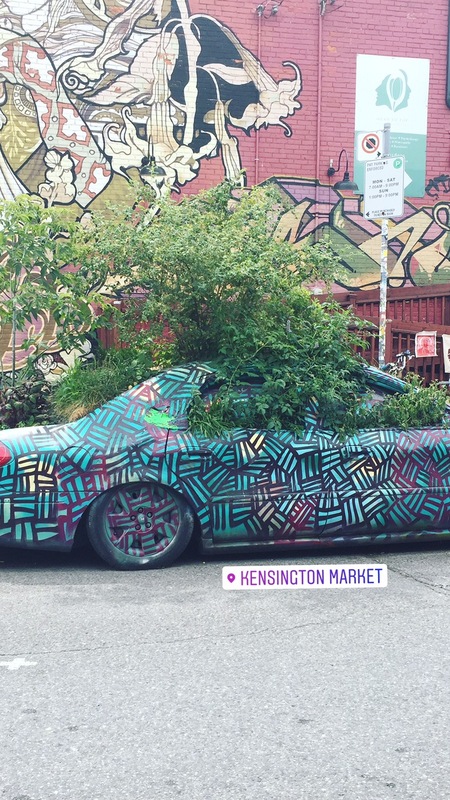 When you visit downtown Toronto, you’re guaranteed to be told to check out Kensington Market. It is one of the most interesting and diverse areas of the city, and you’d be surprised at just how much can be crammed into a tiny space. I didn’t know this, but in 2006, Kensington Market was declared a National Historic Site of Canada! Geographically, it is located between College St to the north, Spadina Ave. on the east, Dundas St W to the south and Bathurst St. to the west. Historically speaking, this little area has seen its fair share of changes: once being a a parade ground for cavalry troops and military command center during the Upper Canada Rebellion (early 1800’s), to a Jewish Market, to a safe space for new immigrants and students. There has always been an effort to keep local and family businesses afloat; apparently Nike tried to open a store in the market and it was met with forceful backlash from the community. It is mostly known for its cultural and artistic community, featuring an ecclectic offer for boutiques, restaurants, and groceries. We’ve explored the market in the dead of winter as well as in the middle of the summer, and both times, it has been alive with music, people, and amazing smells coming from local bakeries and restaurants. Here is our roundup of our favourite stores, but keep in mind that the list grows every time we visit! If you’re looking for a mid-afternoon pick-me-up and sugar rush, Wanda’s Pie in the Sky is the place to go! They offer an amazing menu of vegetarian meals and delicious pies and other baked goods. You’ll be greeted at the door by the amazing smells of freshly baked pies and smiles from the staff. This is a must stop for lunch, especially if you have some little ones with you! Now, I’m going to be honnest: the only reason why we stopped here last winter was to grab something to warm up our hands. I didn’t notice the sign, but Marie and our friends did… they serve Nutella coffee. Yup! You’ll be able to enjoy a super rich and naughty treat which is bound to get your heart racing (for all the wrong reasons). It’s apparently delicious, so you’ll need to let me know! If you’re into thrifting or finding vintage pieces, Bungalow is for you! They offer a mix of clothing and accessories and home furniture, and you’re bound to find something to your taste. This time around, I found some side tables and chairs that I really wished I could leave with, but travelling by train isn’t the most optimal. Welcome tommy heaven: a mostly food related book store! Last year, I found my now most favourite cookbook ever, and this year, I cried when I left since I couldn’t afford to buy the 10+ books I had found. This is your stop if you’re looking to find a gift for that foodie in your life. New new to the neighbourhood, Upside Cycle Style offers cycling friendly clothing locally handmade! The couple behind the store design and collaborate together to offer us the most versatile and chic officewear that you can feel 100% comfortable in to bike to and from work! Our favourites: cheetah print pencil skirt that has hidden panels that let you extend it so you can sit on your bike, and equestrian inspired blazers (think long back, short front) with strategically placed reflective bands and water repellent fabrics. Hell, I’m planning to buy a couple of pieces, even if I don’t bike! Oh and they offer custom sizing as well! Once you’ve had your fill, you are a 15 minute walking distance (just about as long by streetcar depending the time of day) to head over to the AGO; you even get to walk through the main part of Chinatown on your way there. You’re equally as close to the Royal Ontario Museum (ROM) and shopping on Bloor st and Spadina!